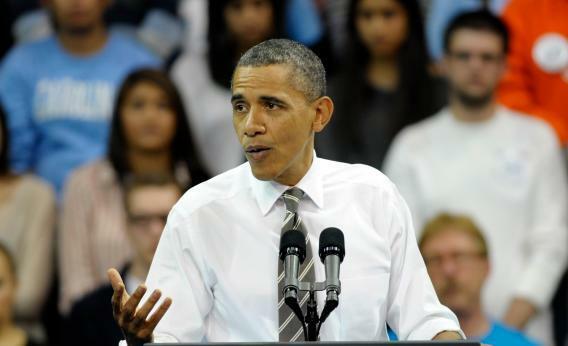 Tar Heel Trouble For Obama? CHAPEL HILL, NC - APRIL 24: U.S. President Barack Obama speaks during his appearance at the University of Chapel Hill on April 24, 2012 in Chapel Hill, North Carolina. The President delivered remarks as part of a effort to get Congress to prevent interest rates on student loans from doubling in July. Romney’s gained 7 points on Obama in North Carolina since April, when the President led by a 49-44 margin. Since then Romney’s erased what was a 51-38 lead for Obama with independents and taken a 42-41 lead with that voting group. He’s also increased his share of the Democratic vote from 15% to 20%, suggesting he’s convincing some more conservative voters within the party to cross over. Color me skeptical. These numbers come at something of a low point for the president, as he’s been struggling to explain a weak jobs report to a frustrated electorate. There’s plenty of time for the Dems to make a comeback, and they’ll get a ton of local media when they have their convention in Charlotte this September. What’s more, as PPP’s always-sharp Tom Jensen notes, this survey shows Obama winning just 76 percent of the black vote. That’s compared to 95 percent in 2008. While some slippage is certainly plausible, it’s tough to imagine Mitt Romney – who has no African Americans anywhere in his orbit or his campaign ads – is going to be the Republican who makes a breakthrough with the black vote.